With over a month of unscheduled time we couldn't think of a better place to spend some time camping than in the Pacific Northwest. With mountains meeting the ocean and lush forest to explore it seemed like a perfect plan, right? The only thing we hadn't taken into consideration was the fact that we typically spend time in this area during the summer, when the weather is warm and the sunshine is plentiful. Unfortunately we didn't take into consideration the fact that not only are most fall/winters in the PNW soggy, this one was record-breakingly so. We are Alaskans after all, so a little rain isn't enough to scare us. But we aren't just US, we are the BUS and us, and the bus had different feelings about the Alaskan motto "change your clothes not your plans" when it comes to bad weather. Not only is outdoor living space crucial when living in such a small space, but so is a break in the moisture, to keep the mold at bay. And to keep everything under the bus fully functioning. It didn't take us long to realize why most of the Vanagons in the northwest were equipped with hard, high tops. Cooking and changing clothes while standing up without having to pop a canvas tent in the rain...genius! We headed towards Neah Bay on the Olympic Peninsula to camp out for a week. On the way we saw a surf spot right off of the highway where there happened to be a gathering of other VW vans. We quickly joined their clan and shared whiskey and stories around the campfire. Finding free camping right on the ocean seems to be virtually impossible to find in the US, let alone with surf out the sliding door, so we were, well, happy campers. Morning coffee with friends surfing in the background are the makings of a good morning. From there we continued for a few hours on a winding two lane road through an old growth forest towards Neah Bay with a few friends and vans from the night before. We rarely pay for camping, but we are willing to if it is a worthy sight. This one at Hobuck Beach Resort proved to be just that. For $20 we fell asleep in the pop top to the sound of waves...can't beat it. Of course, in true VW fashion, we heard a car roll in after the sun had set. It happened to be another VW that wasn't part of the crew we had planned to camp out with. They too were akin to the VW tradition of a quick hello before proceeding to getting inside the van of a complete stranger to investigate cabinet set ups and organizational strategy. After camping at Hobuck Beach Resort we informed by locals that a hike into Shi Shi beach would be soggy but possibly worth the sloppy trudge in. And that it was. Soggy and totally worth it. After a few days of solid downpour the trail comprised of shin deep muck in places and slow hiking, but when we popped out on this beach, all to ourselves, we quickly forgot about our muddy boots. Tessa really has a hard time relaxing and making herself comfortable. After Dillon's work this summer working for the nonprofit Gulf of Alaska Keeper, it is impossible for him to take a stroll on the beach without picking up the debris he comes across, even if that means packing out the garbage for some miles. Hiking and camping in the rain and mud is manageable for a while, but having a dry, cozy cabin to dry out the wet-suits and ourselves was a highly anticipated treat. Hobuck Beach Resort offers tent camping, RV camping and cabins, and all of the spots are just a stone's throw from the ocean. These tiny-home style cabins right on the ocean at Hobuck Beach Resort offered a welcomed refuge as the daily storms rolled through, and motivated us to face the elements for day adventures more than we would have if we only had a damp, cold bus to return to. With the amount of hiking trails and waves to surf we were pretty sure we could have stayed here forever. This point is where the straight of Juan de Fuca meets the Pacific ocean, and as you could imagine this convergence of bodies of water made for some intense waves and water patters. Tessa tested out her new Cotopaxi jacket which kept her nice and toasty in the cool PNW temperatures. You can use the code "Thebusandus" for 15% off if you'd like one for yourself. A portion of their proceeds go to helping with poverty accross the globe! We spend as much of our time as possible in the forests of Alaska but we never tire of exploring the old growth forests in Oregon, Washington and California. Again, returning from our day hikes that always involved some rain, to this humble abode made our time at Hobuck Beach Resort extra special. Hobuck Beach Resort and the town of Neah Bay lie in an Indian reservation. The Makah people are indigenous to this area and still rely heavily on fishing as subsistence. Here a local man puts his skiff in the water from his back porch and sets his nets. The Makah cultural center offered interactive exhibits and insight to how the first people in the area used to live. It houses artifacts from the Ozette archaeological dig that are 500 years old. When our time came to an end at Hobuck we slowly eased our way back towards the city with stopping to explore a few new surf spots for Dillon. While we have been able to drive right up to some incredible spots along the way, we have also learned that putting in the extra work on foot can lead to the best places of all. Hiking in to surf a perfect point break is pretty rewarding, and it is one way to get away from the crowds. While Tessa sat on the beach making jewelry and soaking up the much-missed rays of sun, she was kept company by one of the local surfer's husky. 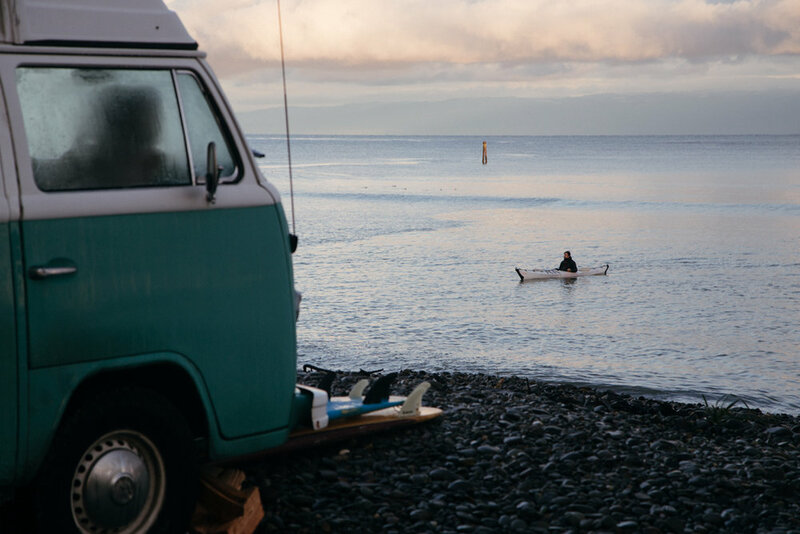 Try as we might have, it was impossible to pass up that free beach front camp spot we spotted on our way up, so we camped out there for another night and awoke to a beautiful sunrise and waters calm enough for a morning paddle. The set up of our Oru kayaks is honestly half of the fun. Starting out the day with a life size origami puzzle is always a good idea. But first...coffee. Although we have been super impressed with the durability of our Oru kayaks, Dillon made sure to keep a bit of distance from the surfable waves, as it was too early for a cold water rescue. With surfing and kayaking out the sliding door, it was hard to pull ourselves away from this spot. 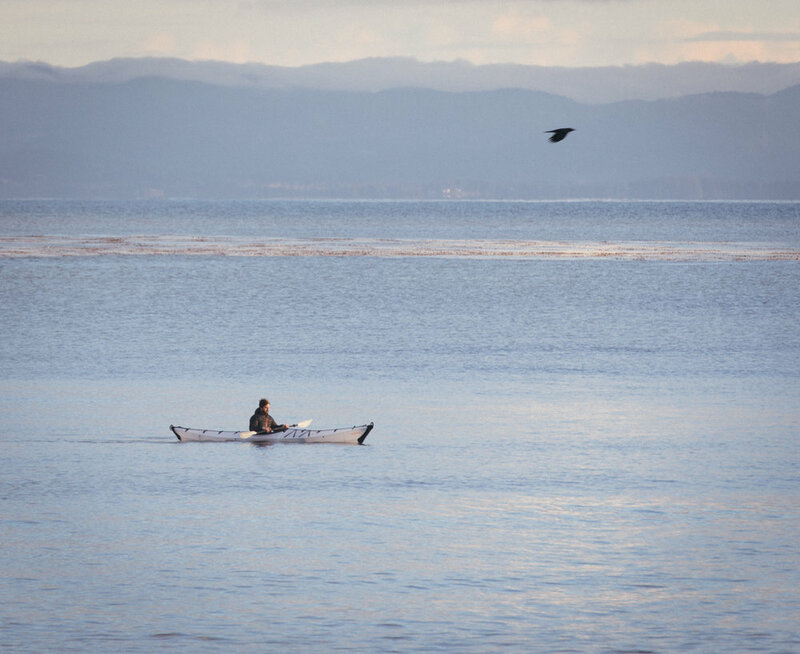 Just Dillon and the birds on the water this peaceful morning on the Straight of Juan de Fuca. We had prided ourselves on the fact that we hadn't bought firewood once on our drive from Alaska to Argenitna, and we had many fires. The bus is equipped with a hatchet and saw for gathering our own wood, but after a few nights around a high maintenance fire whose only offering was ample amounts of smoke, we finally caved. The amount of water that wood can absorb while laying on the forest floor in the PNW is truly astounding. Chicken dogs: the breakfast of champions, and crucial for fueling Tessa's morning paddle.